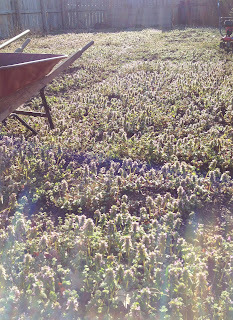 The day I went out to plant peas, I realized the vegetable garden was filled with blooming purple deadnettle and not quite ready for planting. I got the bright idea to use a weed-whacker to at least cut back the flowers of the deadnettle to keep it from setting seed. Then I had an even brighter idea. I decided to hire someone to clear the garden and level it off. Then I had the brightest of ideas. I decided to have the same crew build raised beds with concrete edgers. 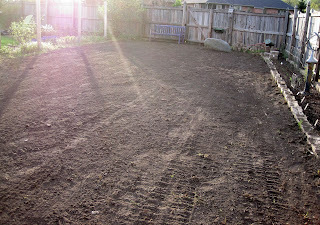 Now the vegetable garden is all laid out and ready to plant. I could not be happier or more eager to plant. It's like Christmas, my birthday, and May, all rolled into one for this gardener. Oh I do know how you feel...sometimes it is just easier to hire the work out. 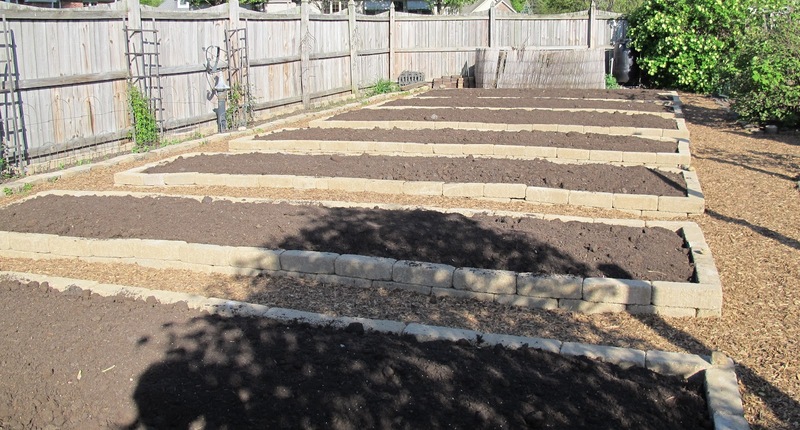 Your raised beds are fabulous! Definitely something to celebrate! Now you have that much more time to plant! 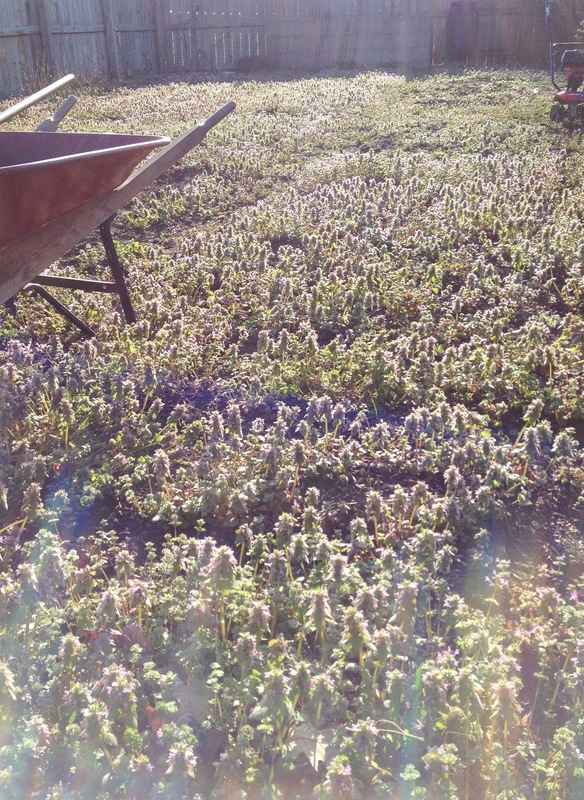 Happy sowing! Wow - Fantastic! I'd definitely feel like it was all those special dates rolled into one. perfect timing too! It's wonderful, Carol. You have some brilliant ideas there! This is great Carol. A spring that you will always remember with this gift of a beautiful as well as functional new veggie garden. It is beautiful! Time is flying - May will be here soon! I'm pushing the envelope here south of you - setting out tomato plants while our night temperatures are still in the 40s. There is still a chance of frost in April. I just can't wait any longer! Five pictures? Love them, love the new, pristine beds. Can't wait to see the bounty. These look like excellent ideas here....I have plenty of ideas, they just don't all get executed. Looks wonderful! Hiring people to do the work is brilliant! Good for you. My brother just made raised beds out of concrete blocks. 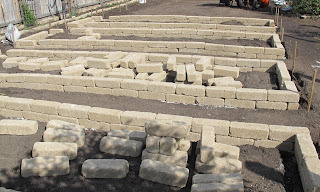 He used cinder blocks and then is going to plants flowers and herbs in the square hollow portion of the blocks. 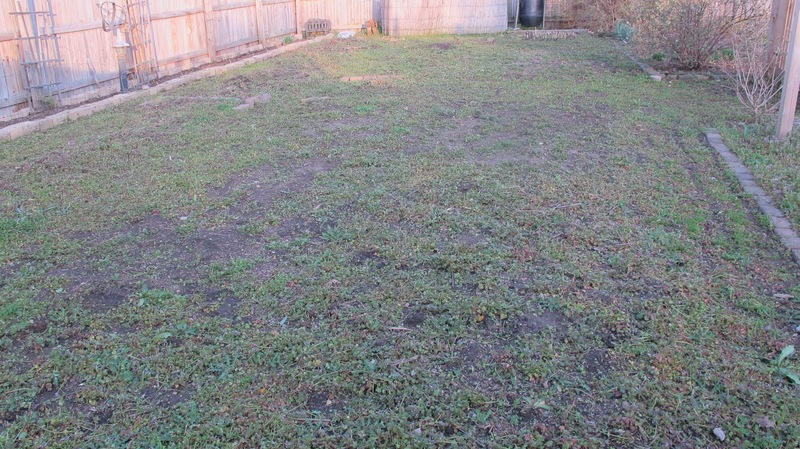 Can't wait to see all the growth in these beds. I'd hire someone too. Thanks for sharing. Wow, this is great! It looks wonderful now and I know it will look greater with plants soon. Raised beds are definitely the way to go. You were very smart to do this and will reap the rewards for years to come. Raised bed = warmer soil, fewer weeds, a more organized garden, a happy gardener! Hmmm...the area was 'not quite ready'. Perhaps a bit of an understatement? I am green with envy!!!! It looks awesome. Hiring out is wonderful (and smart). Oh wow that looks impressive - and it looks as though the beds were filled with lovely compost too! Every time I get a big project done, I feel the same way: Christmas, my birthday, and the month of-well, here, it might be June! I'm thrilled for you! This post seems a good follow-up to the one you wrote about "gardening at the speed of contemplation". I think that getting help with projects sometimes is a good thing; it takes away some of the pressure that comes with trying to do it all. That freedom has to be good for the creative process! Wow!! That is incredible! 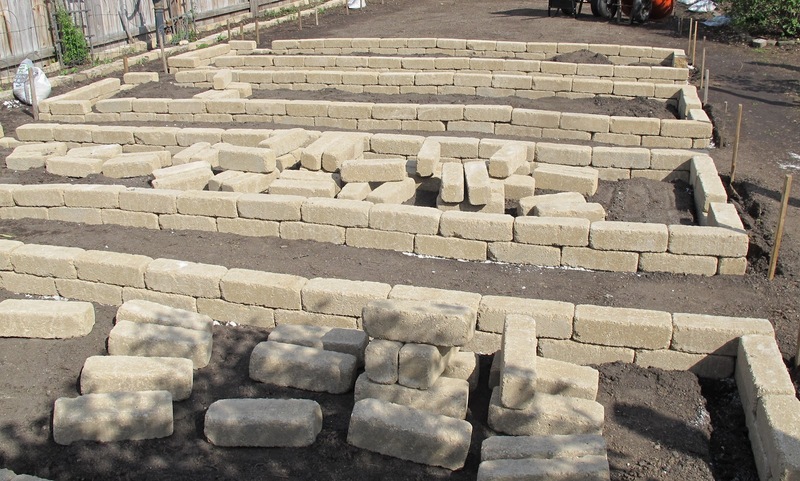 Those pavers make awesome walls for your raised garden beds. Can't wait to see the 'fruits' (or veggies as it may be!) of your labor! Wow... Now there's a great start. 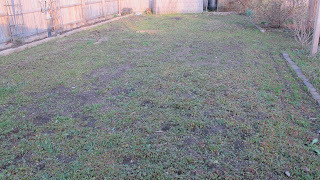 I will be following your blog to see what all you will grow in your new raised beds. Amazing that you got the fairies to do all that work. WIll they be helping you plant it too? Wonderful what a little(or a lot) money will do!